Left to right: Asia Mark, Steven Sapp, Yvette Monique Clark, Kevin Kenerly. Photo courtesy Jenny Graham and the Oregon Shakespeare Festival. 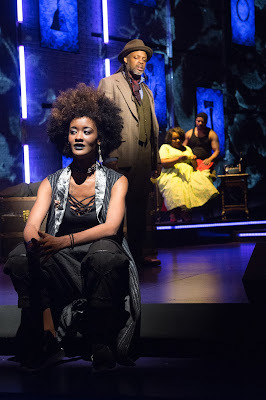 UNIVERSES (Steven Sapp, Mildred Ruiz-Sapp, and William Ruiz) burst onto the Oregon stage in 2012 with their piece Party People, a daring examination of the lives of the Black Panthers and Young Lords. 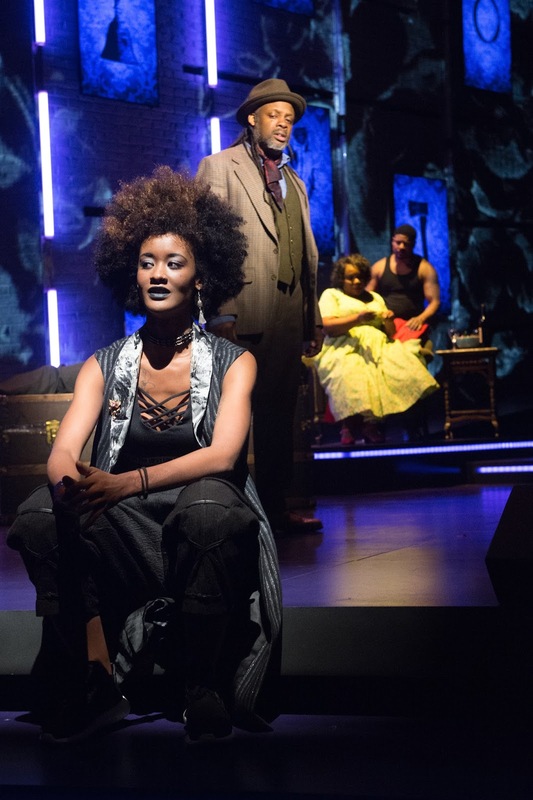 Now, in 2017’s UniSon, they’re using their unique style, which blends emphatic prose, spoken word, light, sound, and movement, to examine and reinterpret the unpublished poetry of the legendary playwright August Wilson. In the midst of a festival dedicated to interpreting and reimagining the works of Shakespeare, it seems fitting that one of the greatest American playwrights gains the same honor. UniSon has a vague plot, but there’s no conventional story progression or character development. Rather, it uses a series of fragments from Wilson’s poetry to construct a metaphorical tale about an apprentice poet who, Pandora-like, opens a chest from her deceased mentor that he told her to destroy. Within it lies the poet’s failings, pains, and regrets, organized into seven “terrors” – each one represented by a member of the acting company – that give the play structure. My favorite terror, in an aesthetic sense, is the morbidly funny Butcher (William Ruiz), a hulking figure who killed his wife when he discovered the Poet was sleeping with her. The segment is intense, with Ruiz hoarsely shouting his anger at the world and at his wife as the stage glows bright red and a butchered pig dangles from the ceiling, but its comedic elements make it reminiscent of Sweeney Todd or perhaps OSF’s 2013 The Unfortunates. Thematically, the most interesting terror is Hunter (Mildred Ruiz-Sapp), who in a haunting tale examines the medium of poetry as a whole and whether a poet has the right to tell other people’s stories for them. Consistent in every terror is the poet (Steven Sapp) and his distraught apprentice (Asia Mark). Asia Mark remains a terrified outsider, both in her actions and in her language, which is down-to-earth and plain compared to the poetry that surrounds her. Her shock and dismay at discovering, through his hidden work, that her image of the Poet as a kindly father figure was distorted, questions whether it’s right to keep some art hidden. Sapp’s Poet is at times remorseful, at times impishly immune, and at times torn by anguish – especially by the question of his father’s true identity. His development over the course of the play represents both his own acceptance of his past and the Apprentice’s growing understanding of him as a complete person. The lighting and set design of UniSon is at times as important to the expression of Wilson’s poetry as the actors. Christopher Acebo’s angular set (making heavy use of video effects from Kaitlyn Pietras) juts into the middle of the action, its sharp angles hewing to modern design construction. The set is, in a way, symbolic of the show as a whole, a combination of 20th-century poetry with UNIVERSES’ postmodern theatre. Alex Jainchills’ lights pulse wildly across the stage, both in the standard top-down lights and through panels installed in the floor: This fully converts the space into whatever the play requires for its emotional expression. UniSon is not a poetry slam, nor does it meander idly through a garden of August Wilson’s poetry. UNIVERSES has taken the work of one of the greatest American masters of language and, while still paying respect to its origins, synthesized it into a truly astounding piece that questions the need for “public” and “private” art, our views of our own heroes, and the skeletons in the closet of artistic expression that nobody wants to address. When you leave the venue, you’ll be asking a number of questions, both about the show and yourself. UniSon runs until October 28th.